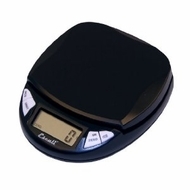 The Escali Pico mini digital scale is a compact workhorse. Measuring in grams, pounds, and ounces this scale has a capacity of 11-pound/5-kilogram. Includes convenient counting feature.